Happy Birthday to my good friend Sally, this one's for you!! 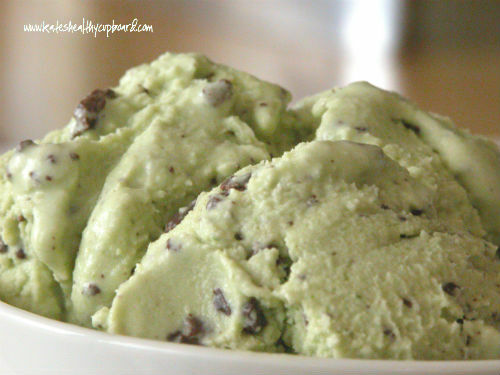 Her one request was that I come up with a good dairy free mint chip ice cream, well I did! Not only is this so darn good, it has spinach hidden in it to give it the green color. So depending on the sweetener you use, this is a guilt free treat with the added nutrition of raw spinach! This is the perfect way to sneak some veggies into your families food! I have to admit, I could eat this everyday! I have made two batches already and thinking it's time for the third! I used an ice cream maker but I think you could simply just freeze it as well. I would suggest letting it get soft serve consistency before you stir in chocolate chunks or they will just fall to the bottom. Place both milks in a saucepan and bring to a simmer, do not let it boil! *I buy my eggs straight from the farm and feel comfortable eating them raw. I skip the heating step and just toss it all in the blender. The yolks make it more creamy but can certainly be left out. I used an erythritol blend for my sweetener. The only drawback is that it makes the ice cream rock hard once you freeze it. I have not tried this, but supposedly some arrowroot powder or a bit of alcohol (vodka or rum) helps with this. This is the perfect summer treat!! !